Link your Bang and Olufsen music system to your new Beosound Core, Edge or Shape speakers! Use this cable to connect your legacy B&O system with Powerlink outputs to a new Beosound Core, Beosound Edge or Beosound Shape speaker. Play your legacy B&O music system directly through your new B&O Edge or Shape speakers! 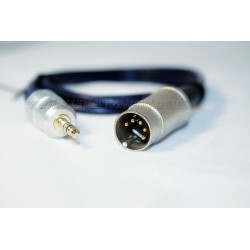 This high quality cable will allow you to connect a Bang and Olufsen music system directly to your new Beosound Core, Beosound Edge or Beosound Shape speakers. This will let you CD, radio, tapes, vinyl and other audio from your Bang and Olufsen system into the 3.5mm input socket. Compatibility: This cable will fit almost all B&O audio systems manufactured since 1990 (requires an 8 pin DIN Powerlink socket). For connection into Beosound Core, Beosound Edge or Beosound Shape speakers. Please check compatibility before you buy - if you are in any doubt, please ask! We chose 5 pin DIN cables as they fit and work perfectly in the 8 pin DIN Powerlink sockets on most B&O systems. Little known fact: the extra pins are only used for sending control data to B&O speakers - hence they are spare in this application. Operation: Please turn up the volume on the audio system to a high level (50-75%) so that it matches the level of the other sources playing on the speakers.